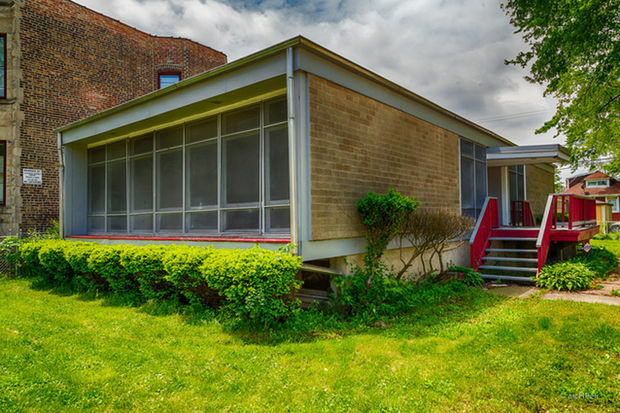 WOODLAWN — A rare house by modernist African-American architect Roger Margerum is on the market in Woodlawn for the first time. The Dr. E.J. Ingram house, at 6500 S. Eberhart Ave., is for sale for $150,000 and still has nearly all of its original features, including a spiral staircase and a lot of wood. 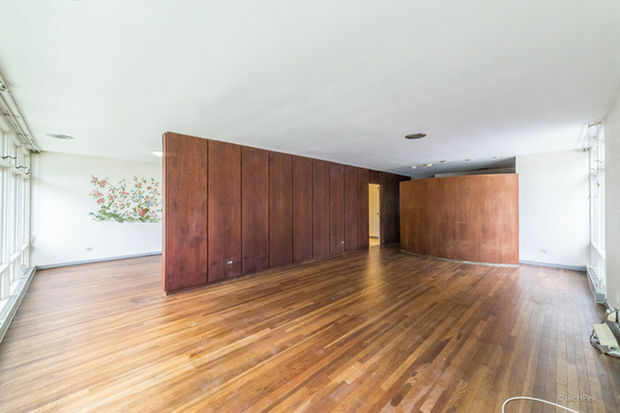 The home is one of the few private homes in the city from the architect who made his name at Skidmore, Owings and Merrill in the 1960s working with the big names in modernist design like Bruce Graham, Walter Netsch and Stanley Tigerman. Margerum is better known in Detroit, where he spent much of his career, leaving the Ingram House, Libby Elementary School, 5338 S. Loomis Ave., and the North Austin Public Library, 5724 W. North Ave., as some of the last examples of his work in Chicago. With only one owner, the Ingram house is a time capsule of Margerum’s design. Wide, boxy and book-ended by walls of windows, the house opens up inside with large areas divided by darkly stained wood panels. 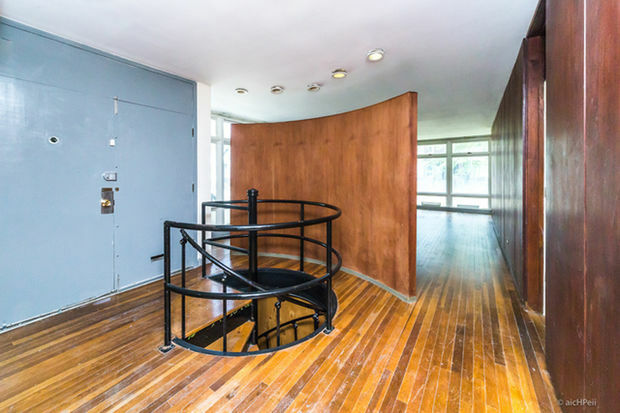 One curved wood-paneled divider hides a spiral staircase to a finished basement also decked out floor to ceiling in wood. But it’s the small details that often don’t survive that might be the most noteworthy. 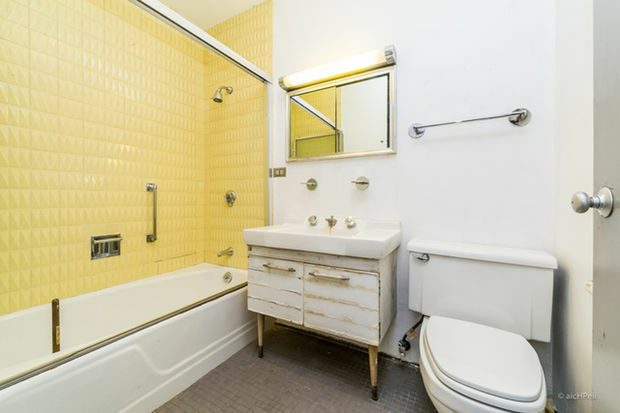 The bathrooms still have the original geometric tiles that in one bathroom creates a wall of low yellow pyramids behind the bathtub. With five bedrooms and 2½ bathrooms in 1,666 square feet, the house is more spacious than it appears on the outside. But it does need some work. 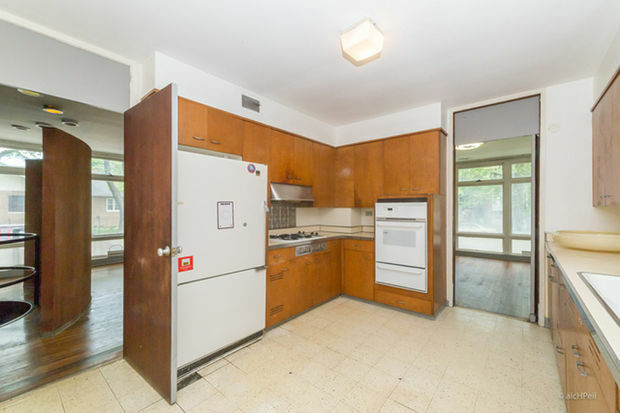 Portions of the basement are not completely finished, and a new owner would need to make difficult decisions about how to update the bathrooms and kitchen while maintaining the more interesting historical features. The house is at the far western edge of Woodlawn, and it will be interesting to see whether a buyer snaps up the historic home, betting that the real estate speculation in east Woodlawn will spread west. The house is on the market for the first time. The bathrooms still have the original unique geometric tiles. Updating the original details in the kitchen and bathrooms could present a challenge to a new owner.